Finally, a rechargeable mobile battery or power pack that is as slim and powerful as your iPhone 6/6s and iPhone6/6s Plus and it comes in colors that match. Let’s face it, the iPhone 6/6s and iPhone 6/6s Plus look great, but when you are on the go you can sometimes run out of juice. That is why we made a rechargeable mobile battery you can plug into your iPhone, recharge and hit the road. But why carry a mobile battery that looks like a brick and weighs as much? We’ve made a mobile battery that is light weight, only 7.9 mm thin, matches your iPhone’s color and has an incredible 6000mAh battery capacity. Just what does that mean? Batteries are measured by how much electric capacity it can hold. What you need to know is there is enough juice to recharge your iPhone. In fact you can recharge your iPhone 6/6s almost 3 times before you need to recharge the mobile battery. You can fully recharge the iPhone 6/6s Plus 1¾ times. Our mobile battery nearly completely recharges an iPad mini 4 and you can half way recharge the bigger iPad pro. The handy LED indicators on the side always lets you know exactly how much power you have left. When it comes time to recharge the mobile battery the fast charging port (input current 3.0 A) really speeds things up. It takes about 3 hours to fully charge the mobile battery. That is 7.5 times faster than a battery with only a 1.0 Amp input current. We want you on the move, not waiting for batteries to recharge. The rechargeable mobile battery comes with a Type A USB to Micro USB charging cable so you can recharge the battery from any AC Adapter or from your computer. With Power Support’s matching USB to Lightning cables you can charge any of the current generation Apple device and you know that if it’s from Power Support it is designed to work with your Apple device. The rechargeable mobile battery is designed you keep your iPhone powered up and look as great as your iPhone. We think Apple’s iPhone 6/6s and iPhone 6/6s Plus look great and we totally embrace Apple’s esthetic. That is why our mobile battery is meant to go with the Apple iPhone 6/6s and iPhone 6/6s Plus, right down to the color. 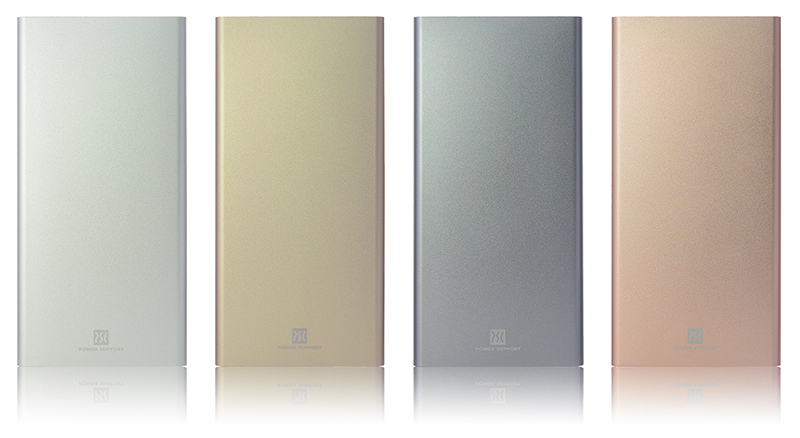 Order your mobile battery in Apple Silver, Gold, Gray or Rose Gold. Extend your reach and maintain your style with our new USB to Lightning USB cables in 1 meter, 1.5 meter and 2 meter lengths in the matching Apple Colors.